With gold at record-high prices, sterling silver is becoming the favored alloy for both professional jewelry designers and their customers. 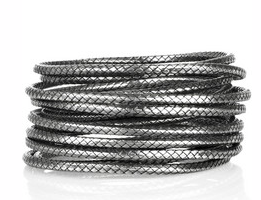 I'm wearing more silver, enjoying its relaxed quality and the presence a substantial piece lends without evident glitz. 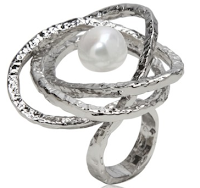 An Andrea Piccini sterling and pearl ring shows that silver need not be austere; price,$550 from Luisaviaroma. The ring comes in two finishes, palladium, the white-metal finish that looks like white gold, or ruthenium, which creates a medium-dark gray metal. These coatings are increasingly used in designer silver jewelry not to disguise the material, but to produce colours other than silver-silver, and to resist tarnish. Silver oxidizes (or tarnishes) it is exposed to oxygen. You may not like that black stuff on your silverware, but jewelers are deliberately oxidizing sterling to create contrast and depth, as shown by Pamela Love's Triple X cuff, very cool. Price, $1,240 at net-a-porter. 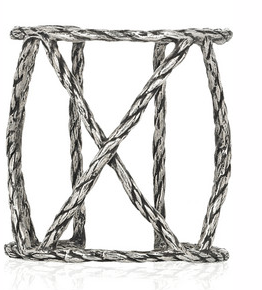 Not much is made that's chic as than Bottega Veneta's oxidized silver coil bracelet in its famous intrecciatto weave, available in three sizes, at BV or net-a-porter (in small only); price, $2,250. 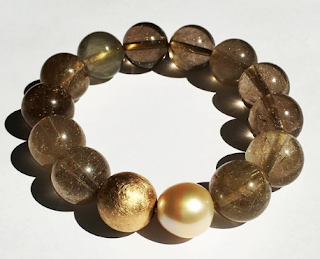 If you want to oxidize your own too-shiny silver beads or other pieces, you can do it yourself using an egg! Here's how. 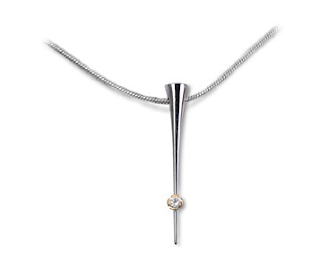 Combining silver and gold in a piece takes a keen sense of design and balance. 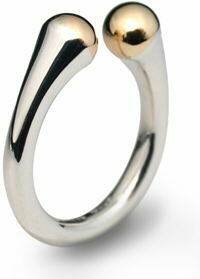 Jeremy Heber shows how in his gold domes ring, a sterling shank tipped with 9ct gold ends. The ring is available in fine and more substantial weights, too. The larger ring is around £85 from Church House Jewellery. Another Jeremy Heber design, the Pirouette pendant, shows the appeal of silver and diamonds. You don't want to set a big diamond directly in silver, especially in a ring, where the soft silver would not stand up to knocking around. But a 2 pt. sparkler in a pendant? Simple and smart. Price, £75. Silver and stamping were made for each other; Auroro Lopez-Mejia's concave Spiral Cross-Stamped Pendant is stamped with evocative imperatives: "the biggest risk in life is not risking... infinite" and on the reverse, "heart-the vital part-invincible: that which cannot be conquered-imagine: to paint with the mind-courage-spirit-love-life". 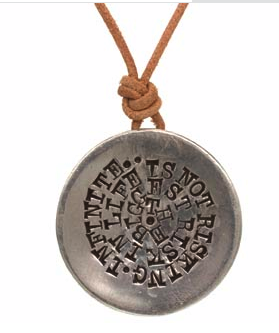 A large pendant (diameter, 1 1/4 inches) with a substantial message, on a 32-inch leather thong. Price, $440 from Twist. A beautiful gift for a friend embarking on a real or metaphorical journey. 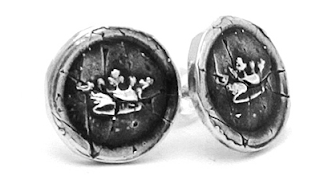 Pyrrha's work is especially refined, so I wanted to show their Crown Wax Seal Studs, which symbolize "dignity and accomplishment". An upcoming graduate would treasure these. Price, $206. Stellar silver: I'll share more finds with you as I find them. 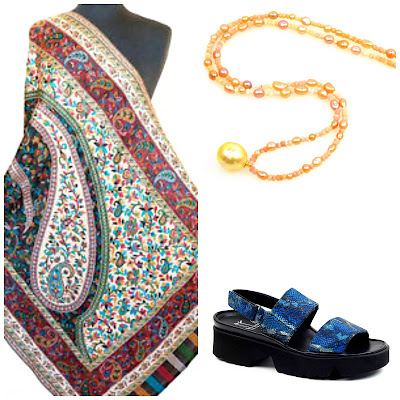 And thank you to the many readers who've shared your favourite artisans. That's what the Passage is here for! I love silver jewellery, it's perfect for every day wear. My favourite silver jewellery is the Turkish filigree kind and I've become a bit of a collector of vintage filigree. Also a quirky bit: my ears are super sensitive and I can only wear silver earrings or else I get a nasty infection. I love silver as well and you have a nice selection here. I'm the opposite of coffeeaddit though, I keep finding lovely silver earrings but they have to have gold posts or I get infections in my ears, silver doesn't work, and the gold has to be good quality, no cheap thin electroplating allowed. Oddly I have one pair of pure silver wires that were my grandmothers that work, so it must be something that is mixed with the silver. But pure silver is too soft for most things. Further research might be required. 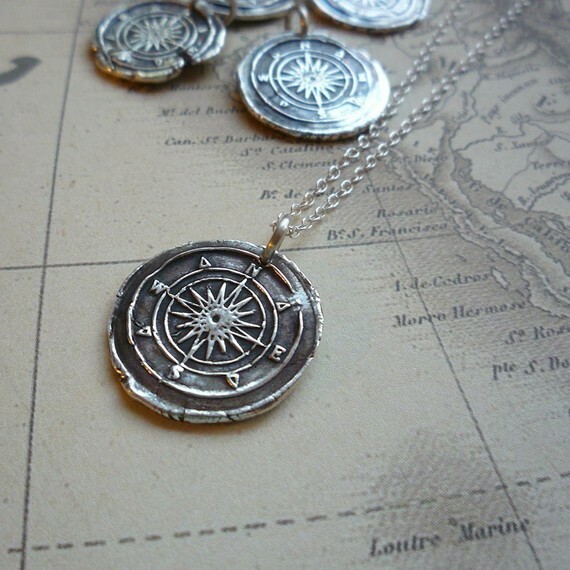 Beautiful pieces, especially love that dome ring and the compass pendants! I love the look of oxidized silver too. coffeeaddict: I'd like to see your vintage filagree, interesting thing to collect. Mardel: The most common allergy is to nickel, a common additive, For that reason some silver earrings have gold posts. Your grandmother's earrings-pure silver- are nickel free. I was sensitive to nickel in my 30s but by my late 30s, no longer. Pseu: Thanks; since many young artists work in silver, it's a rich source for interesting, not too costly jewelry. Thanks for these links, especially to Jeremy Heber's site. Such elegant work. Duchesse: very timely post for me as I have been ogling sterling sliver lately. Does it tarnish? I've had mixed replies to that....help! Thanks in advance. Sue: He works in silver as if it were gold, with a restrained hand. An: Silver tarnishes when it comes into contact with air or certain chemicals, like the sulphur of a hot spring, and body oils. Use a silver polishing cloth (sold at jewelry boutiques or supermarkets) to remove tarnish- a gentle touch is all you need. Store in a jewelry bag to reduce exposure to air. There are some homemade methods using baking soda (search "remove silver tarnish" on net) but I have not used. Silver turns my skin black, and produces an even worse reaction in my ears:(. LPC: I knew that and promise a post on other noble metals just for you. Pyrrha is very popular here in BC and I see many young women wearing the seals. Assorted Sterling bangles are regularly worn on my wrist. Other than the bangles I have very little silver. Beautiful things. I've always favored silver--it suits my coloring better than most gold--and particularly love the soft tone and patina of vintage Mexican jewelry. My little collection, mostly from thrift shops and rummage sales, includes classic hoop earrings by Reven, a 950 silver brooch by Matl, and orchid-shaped earrings, almost abstract, that get compliments whenever I wear them. All were very inexpensive, and though silver pieces are gaining in popularity, there are still beautiful bargains to be found, especially if you're willing to do some polishing. Last week I found an old Zuni needle point turquoise and silver ring for $2.00! For polishing silver jewelry, I prefer those soft flannel polishing cloths; they buff the high points while keeping lower areas darker for depth, and don't leave polish deposits in crevices. But for smooth hoops and bangles, or when traveling, a little bit of toothpaste, rubbed in and wiped off with tissues, works like a charm. Duchesse, thanks for the idea! I'll have to do a post on my filigree jewellery one day soon. The Jeremy Heber Pirouette pendant is my favorite. I'm still on the fence about jewelry in general, but I love my new WendyB zebra stud earrings! 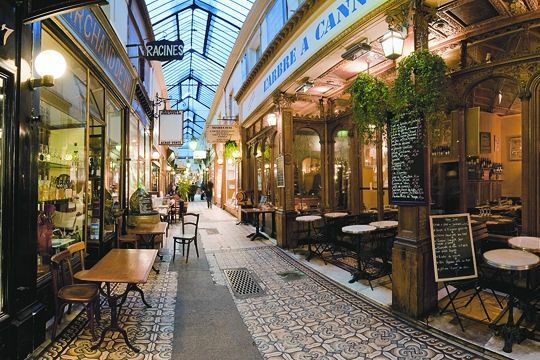 coffee, agree with you on filagree and similar pieces. I'm sure you could wear gold posts as well as gold is less reactive than silver, hence less allergenic. And pieces with heft can be classy in silver when they might possibly read as bling in gold. There is very exquisite Florentine filagree gold jewellery. Hmm, perhaps pseu will find a piece she loves on her upcoming trip? Etsy started as a marketplace for artists to showcase their wares but it has turned into knock-off central. Perpetuating this by citing pieces that are "in the style of" is irresponsible. Recommending copycats hurts everyone! My favorites are also old Mexican pieces that have a subtle artistry. And Scandinavian pieces from decades past. I find silver fun to wear. I will sport a small owl pin in silver that I would never look at in gold. Silver can be piled on with a simple outfit. To my eye silver will enhance where gold will take over. Ooh, I love the ring and the BV bracelet! Anonymous: In the *style* of Pyrrha, but not the same images (as far as I can see from the site), so not a copy. Wax insignia and bas relief casting has been around for centuries; it is not a proprietary technique. Thanks to all for your comments, my impending move makes it impossible to respond individually. Good luck with the move, Duchesse. I hope that all your belongings will fit perfectly in their new home, and that you will soon feel settled. Whenever a friend moves to a new place, I give her a copy of a favorite essay by Colette called "Three...Six...Nine..." to ease the transition. It's a delicious and clear-eyed exercise in house-nostalgia; I wish I could send it to you, too. Maybe you will come upon it one day, and read it in French! Meanwhile, "En route, en route," as Colette says, "And what better massage than an earthquake?"